It's easy to let oneself think that it was Germany which occupied Ukraine for most of 1918, creating a Protectorate under the shelter of which the Ukrainian National Republic operated . But actually it was the Central Powers who together occupied Ukraine, so that you also find occupying Austro-Hungarian troops - as I will soon illustrate. Imperial Russian Brailov, Podolia guberniya, was a small town south east of the regional centre of Vinnitsa and north west of Zhmerinka. In the 1890s it had a population of about 9000, of whom about 4000 were classified as Jews. By the mid 1920s the population had shrunk to around 3000 and nearly 100% were Jewish. A Pogrom in 1919, during Denikin's White Army occupation of Ukraine, had left 20 dead and a hundred women raped. He has gone to the Brailov post office and registered a Kerensky postcard uprated to a total of 35 kopecks with five stamps. This is the correct rate according to the UNR Tariff of 28 January 1918 *. It looks a bit philatelic but it isn't: either the Brailov post office had run out of much-used 5 and 10 kopeck stamps or else Yakov had some stamps at home that he wanted to use up. 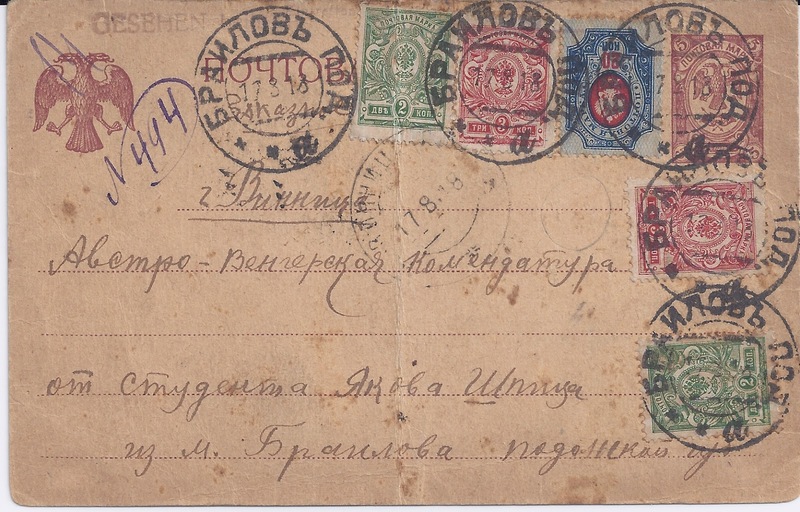 The Brailov postal clerk has recorded the card as "N 494" in his Registry book - see the Manuscript in violet, top left of the card - and cancelled the stamps BRAILOV POD "a" 17 8 18. A bit remarkably, the card arrived the same day in Vinnitsa: there is the receiving postmark of that town, weakly struck, in the centre of the card. Please give me a Pass [ Erlaubnis] for travelling to Crimea, to the town of Yalta, where one finds the University, where I am a student. I must travel there in a few days to learn and without a Pass from the Command one cannot travel to Crimea. 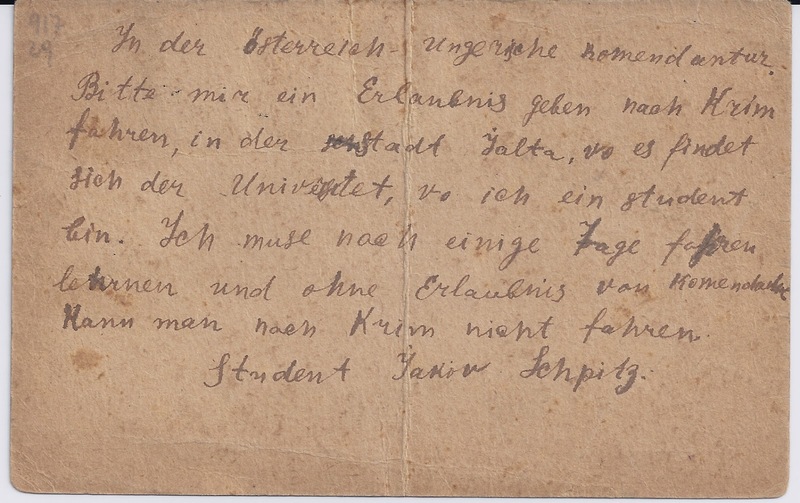 The Austro - Hungarian Command endorsed the card on the front, top left, with a cachet reading GESEHEN [Seen] and two or three other words which I can't read. Yakov has Germanised his surname but his name would more accurately transliterate from Russian as Shpits (which is how it appears on Google). Either way, he is recorded as dying in Kyiv in 1941 with one of his brothers, Ovsey Shpits, surviving to die in Odessa / Odesa in 1986. Soviet Ukrainian Brailiv was occupied by German troops on 17 July 1941 and most of the remaining Jewish population was liquidated locally between February and August 1942.